We’re pleased to kick off our series of previews for our latest Storyline Organized Play event, Marvel HeroClix: Civil War! The Storyline OP begin this June so be sure to visit the WizKids Info Network to find stores hosting official Marvel HeroClix: Civil War Storyline OP events near you. 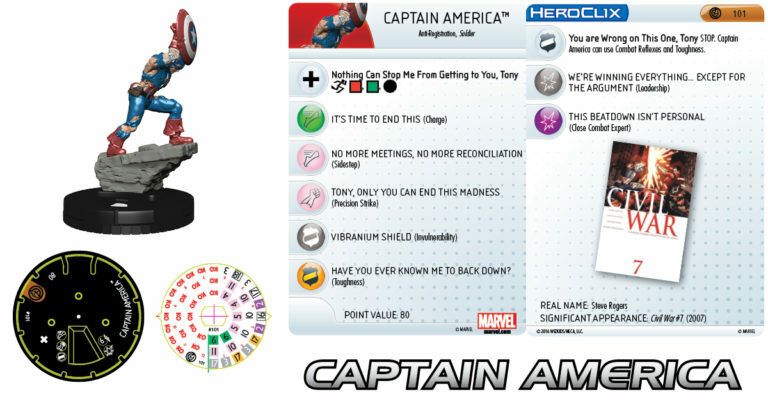 These Marvel HeroClix: Civil War Storyline OP events will be different from previous OP events as the set was designed and tailored to the characters and their factions . Each Civil War five-figure booster pack contains characters from the Pro-Registration, Anti-Registration, and Neutral factions. 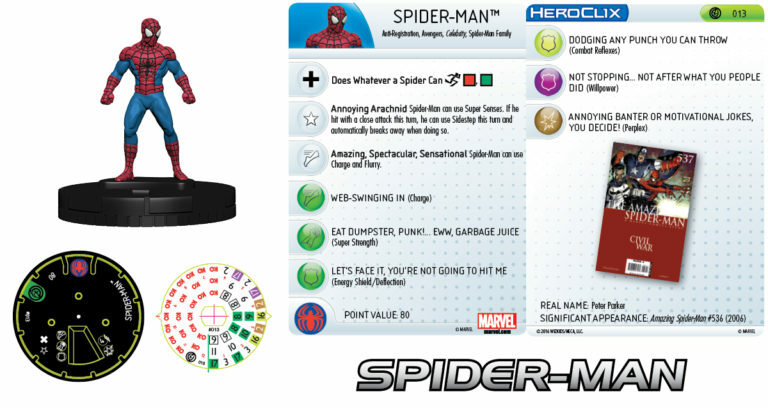 Each character’s HeroClix base is colored to denote their faction: Pro-Registration characters are red, Anti-Registration characters are blue, and Neutral characters have black bases. For the Civil War Storyline OP set, the characters numbered #001 to #032 were designed in “pairs” of figures that have a similar point cost. All the odd-numbered figures are part of Captain America’s team while the members of Iron Man’s team are even numbered. This character balance will come into play during your team drafting at the events. 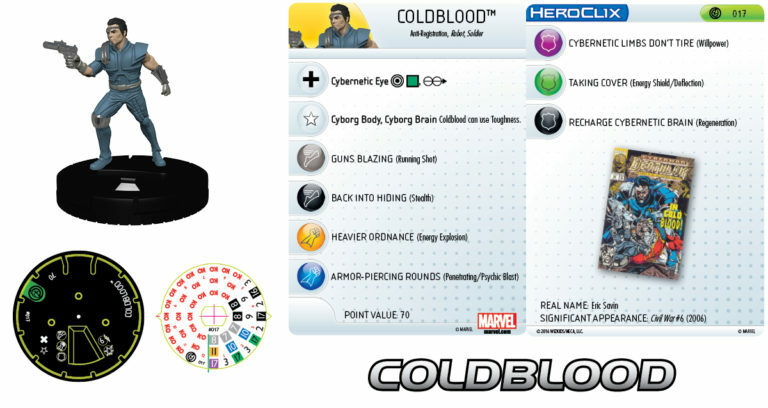 How about we start things off by taking a look at the first pairing of characters in the Marvel HeroClix: Civil War Storyline OP set? First up is Captain America! Captain America comes in at 80 points and has the standard movement, attack, and damage symbols. He also has the Indomitable defense symbol, which lets him act on consecutive turns without fear of taking pushing damage. Captain America’s Improved Movement ability called Soldiering On, lets him ignore hindering terrain and characters when he moves. As the leader of the Anti-Registration forces, Captain America has the Anti-Registration keyword along with Avengers and Soldier to aid you if you choose to include him on a keyword-themed team. Moving on to traits and powers, Captain America hits the battlefield with a trait called Just A Friendly Handshake, which he can only use once per game. Just a Friendly Handshake allows Captain America to neutralize Armor or Robot characters, like Iron Man, for a turn by giving them two action tokens when he hits them with an attack while adjacent. Captain America also has special powers in his defense and damage slots, respectively. In his defense slot is a special power called Blocking Repulsor Blasts, which lets Captain America use Energy Shield/Deflection and Toughness, while also preventing characters from attacking him with Ranged Combat Expert. Captain America’s Energy Shield/Deflection and immunity to Ranged Combat Expert from Blocking Repulsor Blasts help him get into battle even if he is being attacked at range. The special power in Captain America’s damage slot is called Leading the Resistance which lets him use Close Combat Expert and Leadership as if he were 100 points. The remainder of Captain America’s dial features standard powers like Sidestep, Flurry, Charge, Precision Strike, Toughness, Combat Reflexes and Outwit. Captain America also has a solid set of combat values with attack numbers that never dip below 10. Captain America can easily hold his own in close combat but also has a flexible range of five squares to shoot as needed. 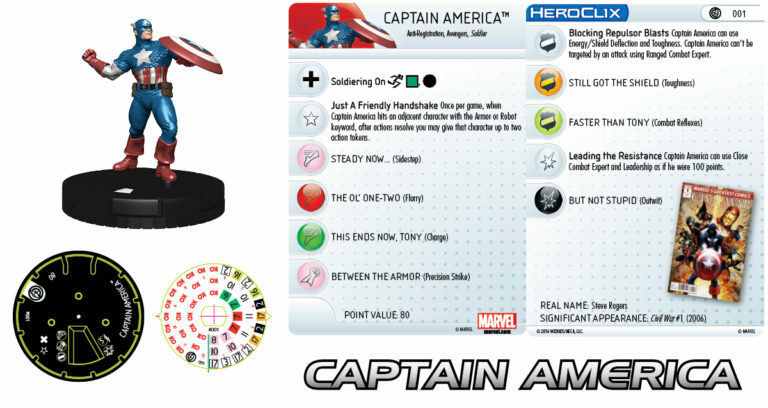 Conversely, his Pro-Registration counterpart in the Marvel HeroClix: Civil War Storyline Organized Play set is a better shooter but can also throw a punch when an opponent gets too close. Let’s take a look at Iron Man! Also coming in at 80 points but with the ability to shoot a single target six squares away, Iron Man has the standard attack and damage symbols and the Indomitable defense symbol. He also has the wing speed symbol, which lets him fly and carry teammates. As the head of the Pro-Registration faction, Iron Man has the Pro-Registration keyword along with Armor, Avengers, Illuminati, S.H.I.E.L.D., and Scientist. As for traits and powers, Iron Man enters play with a trait called I Wanted to Talk, But… which can be used once per game when Iron Man targets a single opposing character with an attack. If Iron Man shares a keyword with the target, he may counter that character’s defense power for the attack. 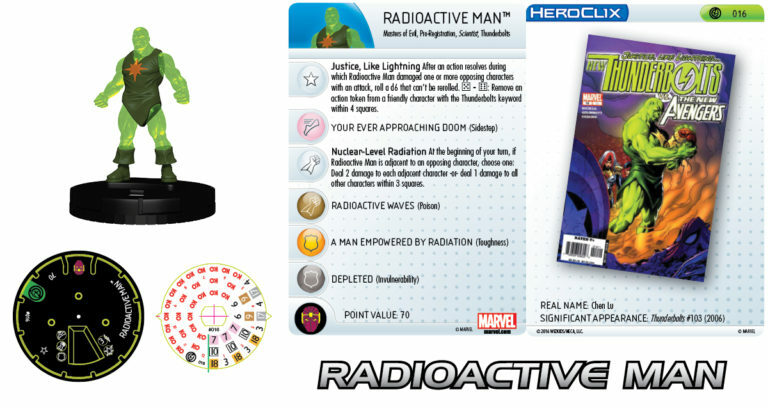 With a lot of Avengers keyword characters involved in the Marvel HeroClix: Civil War Storyline OP, there are a lot of targets for this ability. Like Captain America, Iron Man has special powers in his defense and damage slots. Iron Man’s defensive special power, Your Shield Can’t Scratch Me, Steve, lets him use Impervious. Additionally, Iron Man can’t be targeted by an attack using Close Combat Expert if any characters get too close. Iron Man’s damage special power We Must Follow and Implement the Law, allows him to use Ranged Combat Expert and Leadership as if he were 100 points. Rounding out Iron Man’s dial are the standard powers Sidestep, Force Blast, Energy Explosion, Toughness, Energy Shield/Deflection, and Outwit. As for combat values, Iron Man has slightly higher speed numbers than Captain America but his attack values taper a bit toward the end of his dial. Defense and damage values match on both characters as well. Thanks for reading! Join us again as we reveal more exciting characters and highlight strategies and team builds from the Marvel HeroClix: Civil War Storyline OP set. Don’t forget to mark your calendars as events kick off this June! Today, we’re going to further explore our upcoming Marvel HeroClix: Civil War Storyline Organized Play Event Series! Please be sure to visit the WizKids Info Network to find a local venue that will be hosting Marvel HeroClix: Civil War Storyline OP events, as they kick off in June! 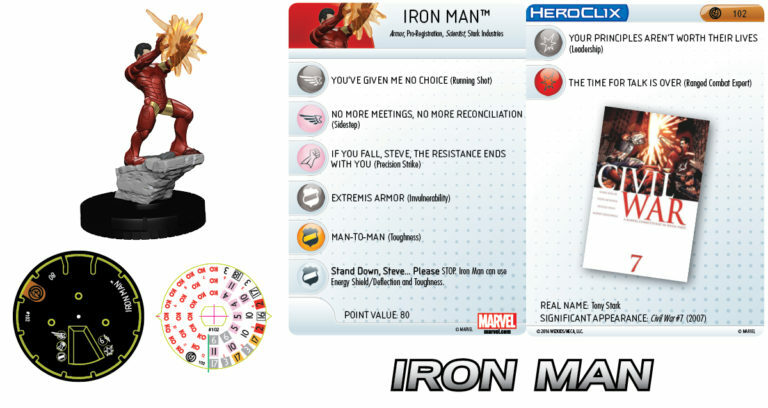 As we mentioned in our previous look into the set, the Marvel HeroClix: Civil War Storyline OP events are slightly different from our previous OP events, as the set is focused on the characters and their factions. 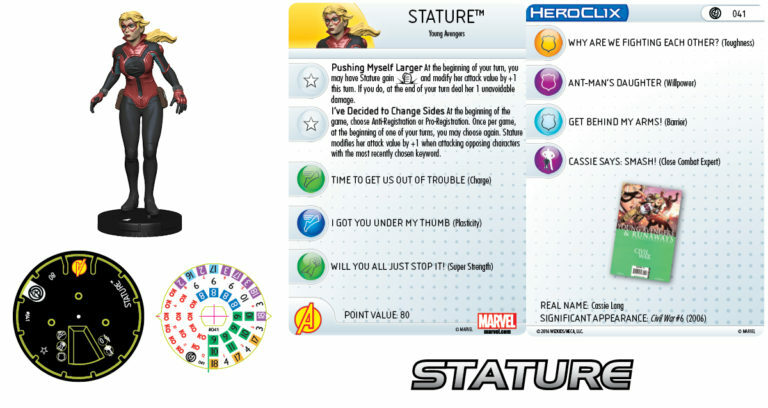 Each of the five-figure Marvel HeroClix: Civil War Boosters contain characters from Pro-Registration, Anti-Registration, and Neutral factions, with each base color-coded to show their faction. Today, we’re going to look at opposing power-houses from the Anti-Registration and Pro-Registration sides – first, we have Hercules! 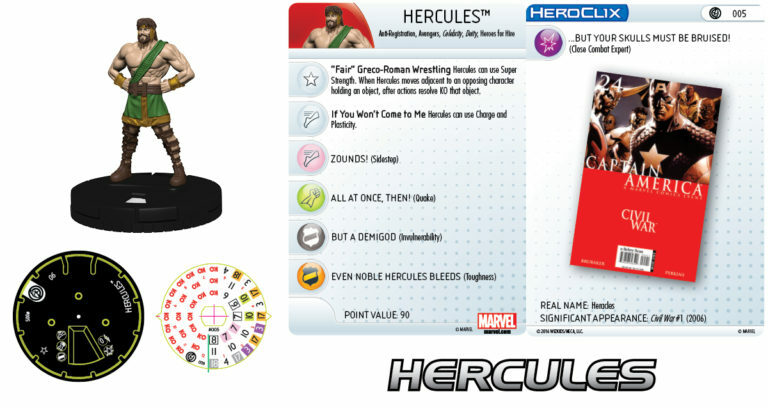 The Greek demigod Hercules is an indomitable 90-point piece, with six clicks of life and power for days! To start, Hercules possesses the trait “Fair” Greco-Roman Wrestling, which allows Herc to use Super Strength. Additionally, when he moves adjacent to an opposing character holding an object, after actions resolve, KO that object. With regards to Hercules powers, he possesses three clicks of a special power called If You Won’t Come to Me, which allows Hercules to use both Charge and Plasticity. He also possesses significant standard powers which really flesh out the Lion of Olympus, with Sidestep, Quake, Invulnerability, Toughness, and Close Combat Expert. With those powers, Hercules is also in possession of keywords that allow him to slot in on some powerful themed teams, with Anti-Registration, Avengers, Celebrity, Deity, and Heroes for Hire! Switching over to the Pro-Registration side of things, we have the Jade Giantess herself, She-Hulk! Shulkie, much like her counterpart Hercules, is an indomitable 90-point warrior with six clicks of life. 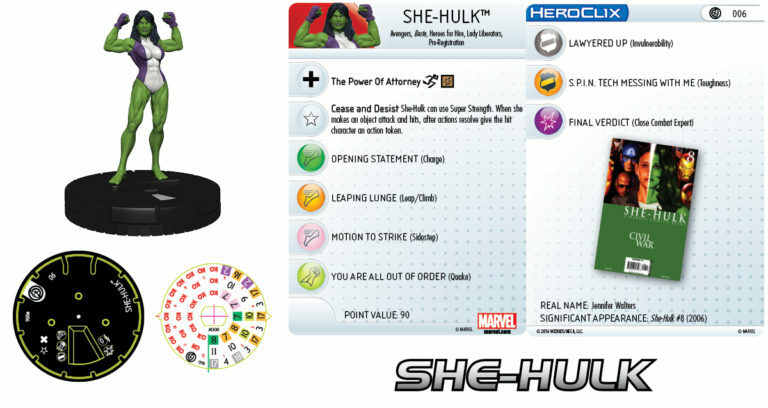 There are some similarities in their power set, but where She-Hulk stands apart is with her Improved Movement – Ignores Blocking Terrain and Destroys Blocking Terrain as the Character Moves Through It, and her trait, Cease and Desist. Like Hercules, this trait grants Super Strength, but it differentiates itself by stating that when She-Hulk makes an object attack and hits, after actions resolve, the hit character is given an action token! Her standard powers are pure She-Hulk, with Charge, Leap/Climb, Sidestep, Quake, Invulnerability, Toughness, and Close Combat Expert. She also brings many team building options to the table, with her keywords of Avengers, Brute, Heroes for Hire, Lady Liberators, and Pro-Registration. That’s all for today, ‘Clix fans! Check back next time as we take another look at opposing forces from the Marvel HeroClix: Civil War Storyline OP! Until then, don’t be afraid to push! The Marvel HeroClix: Civil War Storyline Organized Play Event Series kicks off this June at Friendly Local Game Stores around the world. In just a few weeks, players will need to choose to join the battle with Iron Man and other Pro-Registration heroes or alongside Captain America and his band of Anti-Registration vigilantes. The Marvel HeroClix: Civil War Storyline OP has more prizes than ever with six different Limited Edition Monthly Prize Figures and eight exclusive Civil War Grand Prize figures. Each month, players will compete to win monthly prize figures and Tournament Points. At the end of Month 4, the total of each players Tournament Points is calculated to determine the Grand Prize draft order. 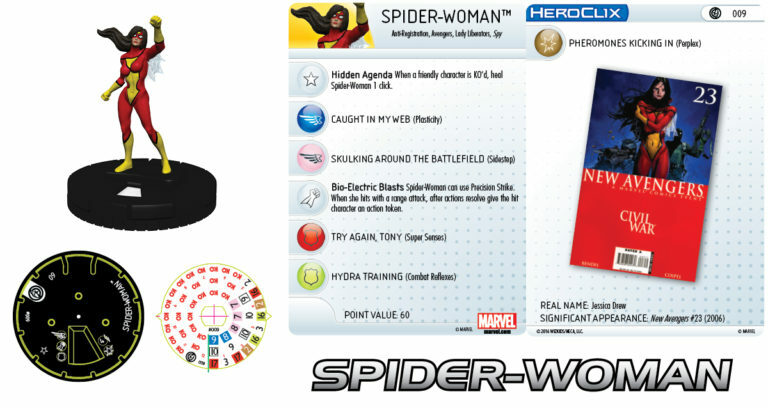 Stores that received one case of Marvel HeroClix: Civil War Storyline OP Booster Bricks a month will receive one Grand Prize Kit that will support up to 16 players. Stores that received two cases of Booster Bricks each month will receive two Grand Prize Kit that will support up to 32 players. Over the next few months, we will be previewing the figures that come in the Booster Bricks, Support Prize Packs, and Grand Prize Kits. We recently previewed the 001 Captain America and 002 Iron Man figures from the Booster Brick. Today, we are excited to reveal our first Grand Prize Figures. While each of these figures can be found individually in the Monthly Support Prize Packs, they come together in an iconic pose for the Grand Prize Kit. Check out the prize figure versions of Captain America 101 and Iron Man 102! 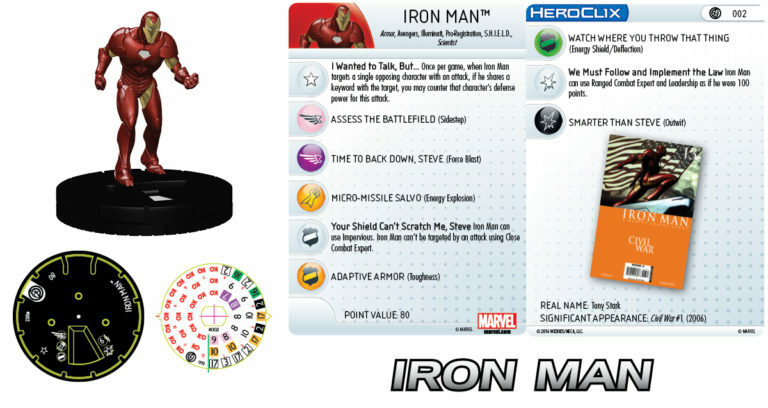 The Marvel HeroClix: Civil War Storyline Organized Play Events are only a few weeks away. Keep a look out for more previews over the next few weeks and be sure to visit the WizKids Info Network to find stores hosting events near you! 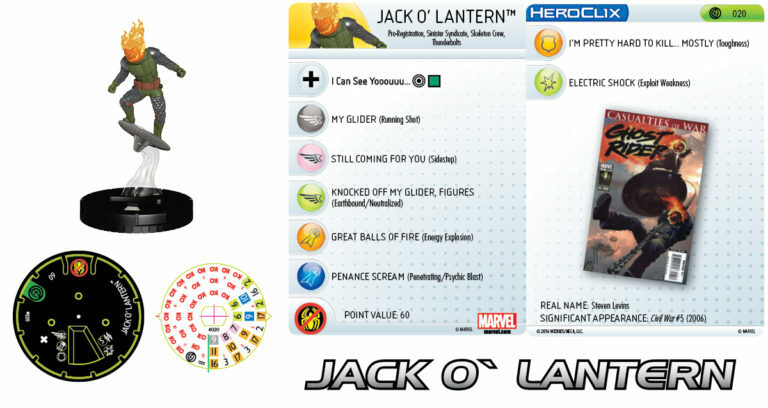 Greetings HeroClix Fans! Civil War is upon us! Beginning June 1st HeroClix venues all over the world will kick off the Marvel HeroClix: Civil War Storyline Organized Play. Choose your side, whether you stand with Tony Stark on the Pro-Registration side -or- with Captain America on the Anti-Registration side, both teams are equally balanced and ready to play. It is up to you (and your dice) to decide who is victorious! Today’s preview of the Marvel HeroClix: Civil War Storyline OP gives you a taste of that balance as we look at team members on each side of the conflict. Two heroes who have to shop the ‘Big and Tall’ section for new suits, Atlas & Goliath! Co-opted by the government as part of the Thunderbolts team of (semi) reformed super powered criminals, Atlas represents the Pro-Registration forces supporting Iron Man. At 90 points, Atlas provides a strong backbone for your team. With abilities provided by the Indomitable defense symbol, the Giant damage symbol, and the Masters of Evil team ability, he can keep moving and keep hitting whenever you need to dish out damage. There is a good chance he will always have something close by to hit with the Giant Reach ability. He has movement options at every position on his dial with a starting click of Charge, two clicks of a special movement power Just Like When We Invaded the Mansion that lets him use Flurry and Sidestep, and when using Flurry he can place any hit characters adjacent to him after the action ends, and then he finishes with regular Sidestep. With some Quake and Close Combat Expert, on attack and damage respectively, he can be useful for hitting multiple targets or singling out just one. His attack stays at a consistent 10 with a little rise at the end and his damage never drops below 3. Atlas is also sturdy enough to take some heavy hits with Impervious, Invulnerability, and Toughness for damage reduction on every click. He also works as a team player with the Justice Like Lightning trait that is also featured on the other Thunderbolts members in this set, which gives him the chance to remove an action token from a friendly character with the Thunderbolts keyword within 4 squares whenever he damages one or more characters with an attack. Now let’s see who he will likely be grappling with on the Marvel HeroClix: Civil War battlefield. Matching Atlas at 90 points, Goliath sports the Indomitable and Giant Size abilities for Captain America’s Anti-Registration faction. He also has the Defenders team ability to share his healthy starting 18 defense value with other Defenders or Wild Card characters. As more of a traditional heavy hitter, Goliath strides ahead at the opposition with Charge and Super Strength, switching over to Sidestep and Close Combat Expert mid dial. He finishes with higher attack and damage values as a last ditch effort to help his team, with the Get Ready for the Shortest Comeback in History that lets him use Charge without reducing his speed value by half. 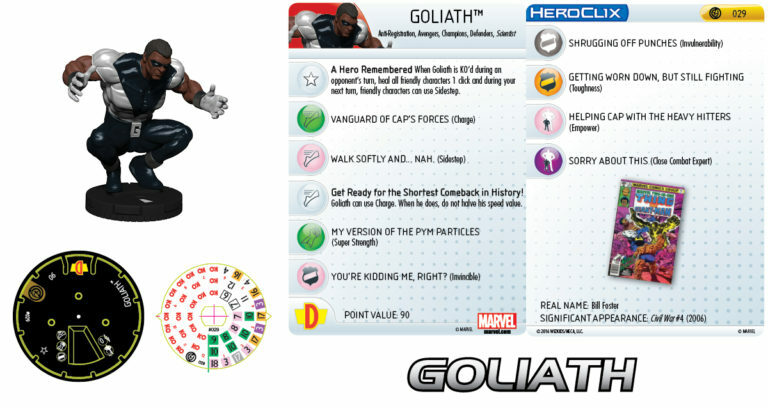 If Goliath falls in clix combat just as he did in the comics his trait, A Hero Remembered will trigger and result in a click of healing for the rest of his teammates, and the use of Sidestep if he is KO’d during your opponent’s turn. His defensive line of Invincible, Invulnerability, and Toughness should keep you from seeing his KO clicks too early though. That’s all for today, HeroClix fans! Log into the WizKids Info Network to find Marvel HeroClix: Civil War Storyline OP Events near you starting in June! Until next time, keep your dice on the table and your eyes on the map! Greetings HeroClix fans, and welcome to another exciting look into the world of the upcoming Marvel HeroClix: Civil War Storyline OP event! Today, we’re looking at two sharpshooters from opposing sides of the battle – Coldblood and Bullseye! Up first, representing the Anti-Registration efforts, is the cyborg soldier Coldblood! Right out of the gate, Coldblood has Improved Targeting: Ignores Hindering Terrain, and may make a ranged combat attack against any opposing character within range and line of fire, even if that character is in an adjacent square. Additionally, he possesses a trait called Cyborg Body, Cyborg Brain which grants Coldblood the use of Toughness. With those powers, he also is able to use Running Shot, Stealth, Energy Explosion, Penetrating/Psychic Blast, Willpower, Energy Shield/Deflection, and Regeneration. Coldblood also has a range of six squares, so not only are you able to make effective ranged combat attacks via his Improved Targeting ability, but you can keep him on the periphery of the fight in order to pick off stragglers from your opponent’s forces! On the other side of the table comes one of the most deranged villains in the history of the Marvel Universe – Bullseye! A cold blooded murderer, Bullseye comes loaded for bear with Improved Targeting: Ignores Hindering Terrain, Ignores Characters, and may make a ranged combat attack against any opposing character within range and line of fire, even if that character is in an adjacent square. He also possesses two traits – the first plays into his Thunderbolts keyword, called Justice, Like Lightning. This trait states that after actions resolve during which Bullseye damaged one or more opposing characters with an attack, roll a d6 that can’t be rerolled. On a 5 or 6, remove an action token from a friendly character with the Thunderbolts keyword within 4 squares. The other trait, This One’s Got Your Name On It, states that when Bullseye damages an opposing character with an attack, place a marked token on that character’s card. Then, when Bullseye targets a character that has a marked token with an attack, he may remove one marked token from that character to increase damage dealt to that character by 1 if he hits! 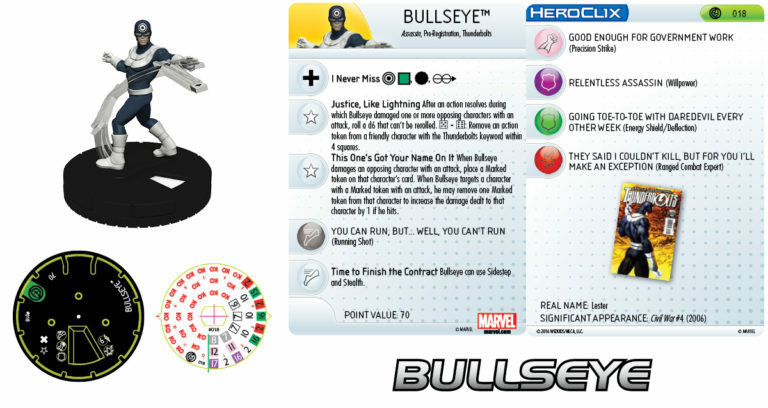 Bullseye also has a bevy of standard powers, including Running Shot, Precision Strike, Willpower, Energy Shield/Deflection, and Ranged Combat Expert, as well as a special power on speed that shows on his final three clicks of life called Time to Finish the Contract. This power states that Bullseye can use both Sidestep and Stealth, allowing him to move into hindering terrain as a free action, and then attack from cover! Both Coldblood and Bullseye have a cost of 70 points, meaning you’ll be able to build around them and have them fill the role of a strong secondary attacker from range. This can offer protection for your support pieces, and be harassing enough that your opponent will have to think twice about focusing efforts on your tentpole or tank character. Having a solid perplexer on this team would be beneficial, as granting both Coldblood and Bullseye a boost to damage or range would make these two already effective fighters even more dangerous! That’s it for now, ‘Clix fans! Stay tuned for more exciting previews from the Marvel HeroClix: Civil War Storyline OP and visit the WizKids Info Network to find events near you starting tomorrow! Greetings once again, HeroClix fans! Today, we’re taking another look into the Marvel HeroClix: Civil War Storyline OP Event, with one of the most skilled combatants in the Marvel Universe – the Taskmaster! A feared villain turned trainer for the Initiative, Taskmaster is an incredible fighter with a photographic memory, allowing him to adapt to the fighting style of anyone he’s ever faced before, just by watching them move! As such, he’s been able to fight and defeat the likes of Captain America, Daredevil, and Deadpool with relative ease – typically, what defeats Taskmaster is his overconfidence! As a skilled combatant, it’s only fitting he have traits that show that. His first, called I Took Out the Avengers Once…Most of Them, states that you may give Taskmaster a free action, choosing one of his combat values that is lower than the same combat value on one adjacent opposing character. You may then modify the chosen combat value by +1 until your next turn, or until his dial is clicked. His second trait really emphasizes Taskmaster’s versatility in combat, and is called Master of All Moves. This trait says that at the beginning of your turn, you may turn Taskmaster’s dial to another click. If you do, at the end of your turn, return him to the click he began the turn on! Normally, it would make sense to run through power by power, but in the case of Taskmaster, it makes more sense to look at the situations that his dial layout and design offer. Need to work from the shadows? Click 1 offers Stealth, Precision Strike, Super Senses, and Perplex. Ranged combat is the order of the round? Make use of his range of 5 squares on click 3, giving you Running Shot, Penetrating/Psychic Blast, Energy Shield/Deflection, and Enhancement. Locked in close combat and need to deal as much damage as possible to a pesky Shapeshifter? Click 6 offers Flurry, Blades/Claws/Fangs, and Battle Fury. His possibilities are nearly endless, and the opportunities he offers are exciting. Hinted at earlier, Taskmaster is a man of shifting allegiances – and his Minions of Doom team ability solidifies that by making him a wildcard, allowing you to copy other team abilities from your friendly characters. He’s also able to be run on themed teams for Hydra, Initiative, Martial Artist, Pro-Registration, and Thunderbolts! That’s it for today, HeroClix fans! 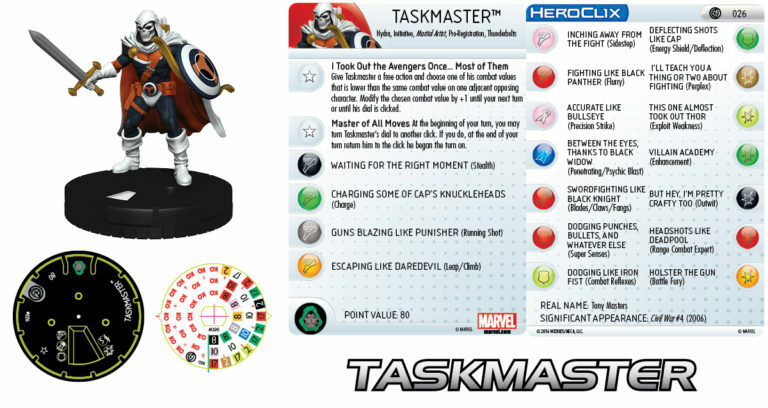 We hope you’ve enjoyed this look at Taskmaster, and that the other items from the Marvel HeroClix: Civil War Storyline OP event have piqued your interest. Visit the WizKids Info Network to find events near you today and stay tuned for more review of the new figures in the coming weeks! Until next time, don’t be afraid to push! A Civil War is upon us! Venues around the world have officially kicked off the Marvel HeroClix: Civil War Storyline Organized Play event series. Choose your side, whether you stand with Tony Stark on the Pro-Registration side or with Captain Rogers on the Anti-Registration side. Both teams are equally balanced and ready to play. It is up to you, and your dice, to decide who is victorious! Today we continue to feature that balance as we look at two heroes, one on each side of the conflict. Both fill similar roles on their respective teams, including the dodgy and elusive secondary attacker, the harassment piece that cannot be ignored, the sleeper hitter, and possibly the surprise champion of your team. Filling these roles today, we have Daredevil and Wasp! Though the character’s name is Daredevil, his Real Name listed on the back of the card tells a different story. During the time of the fight over the Super Human Registration Act, Daredevil’s secret identity as New York based lawyer Matt Murdock was leaked to the tabloids. He was under heavy scrutiny by paparazzi, the New York press, the police and FBI, and of course several of his old nemeses, who showed up at his doorstep. To deflect suspicions that he was Daredevil and to keep his friends and law practice safe, he made a deal with his friend and fellow martial artist crime fighter Danny Rand, the Iron Fist. Danny was to wear the Daredevil costume and patrol the Hell’s Kitchen neighborhood in Matt’s place until the media frenzy died down. This meant though that when Danny Rand answered the call and joined Captain America’s Anti-Registration forces he was doing so as Daredevil! 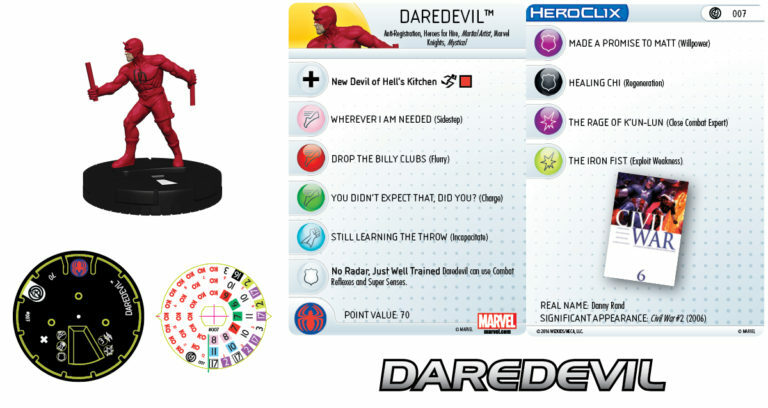 In HeroClix terms, all this history gives him Anti-Registration, Marvel Knights, and Heroes for Hire keywords along with Mystical and Martial Artist, the Spider-Man Ally wildcard team ability and the potential to be called into the fight with the Avengers Round Table resource using either the Daredevil OR Iron Fist Avengers ID Cards. If there is something that both Daredevil and Iron Fist have in common it is avoiding being hit while hitting hard in return. At 70 points, Daredevil makes for an excellent close combat or short range combat piece. With Sidestep, Charge, and Improved Movement: Ignore Elevated Terrain called New Devil of Hell’s Kitchen, he can get anywhere you need him to tie up and engage the opposition. For ranged abilities, he has a 3 range with two targets and Incapacitate to start with, but where he excels is close combat. He begins the game with Close Combat Expert and a special defense power, No Radar, Just Well Trained, that gives him Combat Reflexes and Super Senses to increase his attack, damage, and defense when engaging base to base and dodging incoming attacks. Mid and late dial he switches to Willpower to get more actions and tries some other kung-fu methods with alternating Flurry and Exploit Weakness. With a single click of Regeneration on his 6th and last click, Daredevil will hopefully be able to stay in the fight. Fighting for the Pro-Registration forces at 70 points is Wasp. Wasp has several ways to elude your opponent and their dice with the Flight symbol, the Tiny Size symbol, Improved Movement: Ignore Characters called Social Butterfly along with a full dial of both Super Senses and Sidestep. 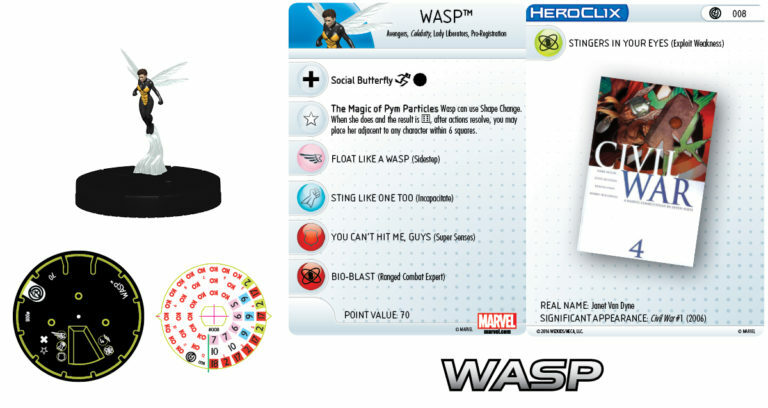 Wasp also has a trait called The Magic of Pym Particles that grants her the use of Shape Change, and if she rolls a 6 while using it, she may be placed adjacent to any character within 6 squares. Offensively she has a 4 range with a single target and starts off making use of it with Range Combat Expert and later in her 5 click dial she wants to get up close and personal with Incapacitate and Exploit Weakness while maintaining consistent combat values. She will be very hard to pin down and hit due to her dangerous options that cannot be easily ignored by an opponent. She also has the Avengers, Lady Liberators, Pro-Registration, and Celebrity keywords for your theme team building enjoyment. That’s all for today, HeroClix fans! We hope you enjoyed today’s article on the elusive attackers, Daredevil and Wasp. Log into the WizKids Info Network and find Marvel HeroClix: Civil War Storyline OP tournaments near you and choose your side. Greetings HeroClix fans! Today, we’re taking another look at a piece from the Marvel HeroClix: Civil War Storyline Organized Play event! Our piece today features a classic Avenger, as well as member of the Young Avengers – Vision! An 80-point piece, Vision is best suited to move freely about the map, using his range of five squares to pick troublesome opposing figures off from a distance. Of course, that’s not all he’s built for! For example, if you run him on a Young Avengers themed team, you can take advantage of his trait, Protect Cassie No Matter What. This trait provides a unique modifier, stating that if Vision is adjacent to a friendly character named Stature, you modify both of their attack values by +1! Vision also makes use of some significant standard powers. 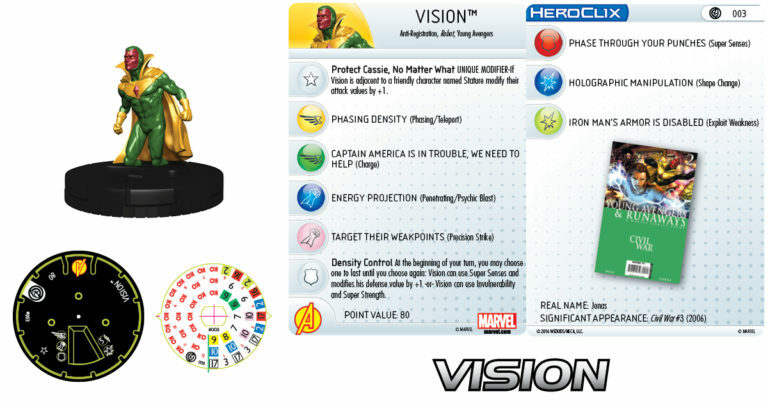 As hinted at earlier, Vision begins the game with two clicks featuring both Phasing/Teleport and Penetrating/Psychic Blast – which are especially useful when positioning and getting him ready to attack characters with damage reducing powers, like Iron Man or Ms. Marvel. His final two clicks also bring two powers well suited to work together, Charge and Exploit Weakness. Other standard powers on his dial include Precision Strike, Shape Change, and Super Senses. One of the Vision’s signature abilities is his ability to become lighter than air or harder than steel, which is represented on his dial by his special power Density Control. Appearing on his first three clicks of defense, Density Control states that at the beginning of your turn, you may choose one of these combinations until you choose again: Vision can use Super Senses and modifies his defense value by +1, or Vision may instead use Invulnerability and Super Strength! A versatile combatant, able to damage in either close combat or ranged combat situations, Vision is a significant addition to any team, and is able to be played on Anti-Registration, Robot, or Young Avengers themed teams. He has a diverse set of abilities, and can suitably fill any role you need at any given time! That’s it for today, ‘Clix fans! Be sure to join us next time as we continue to take more exciting looks at the Marvel HeroClix: Civil War Storyline OP and other upcoming releases! Visit the WizKids Info Network to find events near you. Until next time, push for the win! Today, we’re taking a step back from the sealed portion of the Marvel HeroClix: Civil War Storyline Organized Play event and checking out a constructed team featuring the Anti-Registration members of the New Avengers! Up first is a Hero for Hire who is taking the role of a close-attacking bruiser on our team. Sweet Christmas, it’s Luke Cage! 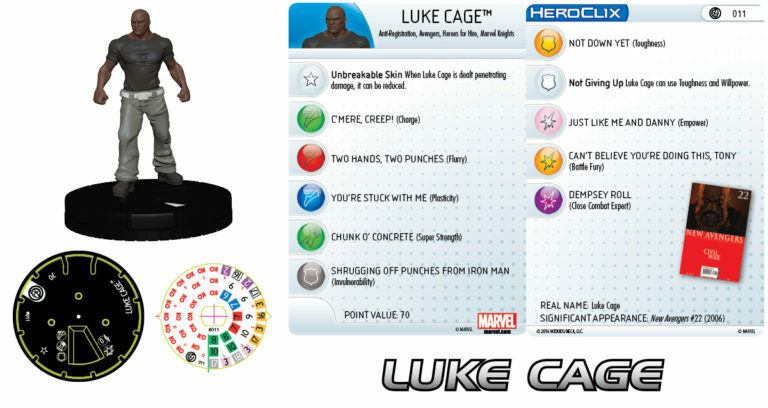 At 70 points, Luke Cage can throw a mean punch and take one, too, thanks to an appropriate power set that includes Charge, Flurry, Super Strength, Invulnerability, Toughness, and Close Combat Expert. Additionally, Luke Cage has a trait called Unbreakable Skin, which lets him reduce penetrating damage dealt to him and thwart powers like Penetrating/Psychic Blast and Exploit Weakness. Luke Cage has the standard speed, attack, defense, and damage combat symbols and starts his dial with the combination of Charge and Super Strength. Be sure to have him grab an object and get him into the fight to deal some extra damage. Also, if you plan ahead when using Charge, you can end Luke Cage’s movement next to a teammate who’s ready to make a close attack and boost that character’s damage with Empower. Toward the end of his dial, Luke Cage picks up a special power called Not Giving Up, which lets him use Toughness and Willpower. Next up on our New Avengers force is Spider-Woman, whose role on our team would be that of a ranged attacker, tie-up, and taxi. Spider-Woman comes in at 60 points and can shoot one target up to four squares away. She also has the standard attack, defense, and damage combat symbols, along with the flyer speed symbol, which grants her the use of the Flight and Carry abilities. Spider-Woman’s power set includes standard powers like Plasticity, Sidestep, Super Senses, Combat Reflexes and Perplex, and makes her difficult to hit and escape from. She also hits the battlefield with a trait called Hidden Agenda, which lets her heal a click when a friendly character is KO’d. Offensively, Spider-Woman has a special power called Bio-Electric Blasts, which allows her to use Precision Strike. Additionally, when she shoots an opponent and hits, her target is given an action token after actions resolve. Bio-Electric Blasts is a power that is useful in limiting your opponent’s options by placing action tokens on enemy characters and Precision Strike to whittle through their dials. Spider-Man is the next member of our force and plays the role of shooter/melee combatant. Spider-Man has a point value of 80 and can shoot a single target up to four squares away. Mobility isn’t a concern for the wall-crawler, who has an Improved Movement ability called Does Whatever a Spider Can, that allows him to ignore elevated and hindering terrain when he moves. Additionally, opponents may have trouble landing attacks on Spider-Man as his Annoying Arachnid trait lets him use Super Senses to potentially evade attacks. Also, if he hits with a close attack, Annoying Arachnid lets him use Sidestep and automatically break away when doing so. When it comes to piling it on in close combat, Spider-Man can use Charge and Flurry through his Amazing, Spectacular, Sensational speed special power. The rest of Spider-Man’s power set features standard powers like Super Strength, Energy Shield/Deflection, Combat Reflexes, Willpower and Perplex. We’ve previously shown you the leader and last member of our New Avengers force, Captain America, but let’s take another look at what ol’ winghead brings to the fight. Like Luke Cage and Spider-Man, Captain America can mix it up in close combat and has the standard powers Flurry and Charge to get down and dirty. He can also play the role of ranged attacker and throw his mighty shield up to five squares away to make his opponents yield. Mobility isn’t much of an issue for Captain America because he can ignore hindering terrain and characters with his Improved Movement ability, called Soldiering On. He also has two special powers, Blocking Repulsor Blasts and Leading the Resistance. Blocking Repulsor Blasts offers him some bonuses and protection from ranged attacks by letting him use Energy Shield/Deflection and Toughness and by preventing him from being targeted by attacks that use Ranged Combat Expert. Leading the Resistance boosts Captain America’s effectiveness in melee situations by letting him use Close Combat Expert and Leadership as if he were 100 points. We hope you’ve enjoyed our New Avengers themed team, featuring figures from the Marvel HeroClix: Civil War Storyline OP, which comes to a total of 290 points. Speaking of themes, all four characters on our New Avengers force have the Anti-Registration and Avengers named keywords. Thanks for reading! Join us again as we highlight more strategies and team builds from the Marvel HeroClix: Civil War Storyline Organized Play set and visit the WizKids Info Network to find events near you! Greetings HeroClix fans, and welcome to a team building exercise featuring one of the signature Pro-Registration teams from the Marvel HeroClix: Civil War Storyline Organized Play Event! Today, we’re looking at a group of “reformed” villains intent on working with the government to correct their misguided ways – the Thunderbolts! There are a lot of options for Thunderbolts characters in this set, and we’ve put together a team for a 300-point constructed game with a good mix of characters and playstyles. Three of these characters were at one-time part of the core Thunderbolts team, with Songbird and Atlas joining at the start, and Radioactive Man coming aboard soon after. As they were all dedicated to improving themselves and leaving their lives of villainy behind, they all share a trait called Justice, Like Lightning, which you may recognize as the tagline of the comic. This trait states that after actions resolve, during which one of those characters damages one or more opposing characters with an attack, roll a d6 that can’t be rerolled. On a result of a 5 or 6, you may remove an action token from a friendly character with the Thunderbolts keyword within five squares. This trait can help the Thunderbolts to keep pursing their targets! Up first is Dr. Chen Lu – the Radioactive Man! A 70-point piece with 5 clicks of life, Radioactive Man is designed to inflict a lot of damage to characters in close situations. He starts with a special power called Nuclear-Level Radiation that gives him a different take on Poison – as long as he is next to an opposing character at the beginning of the turn, Radioactive Man can deal 2 damage to each adjacent character, or instead deal 1 damage to all other characters within 3 squares! He has a solid mix of standard powers as well, bringing Sidestep, Poison, Toughness, and Invulnerability to the table, along with a range of 3 squares, and a natural 3 or 4 damage value throughout his dial! Joining him is one of the most iconic members of the Thunderbolts, the former Screaming Mimi, Songbird! 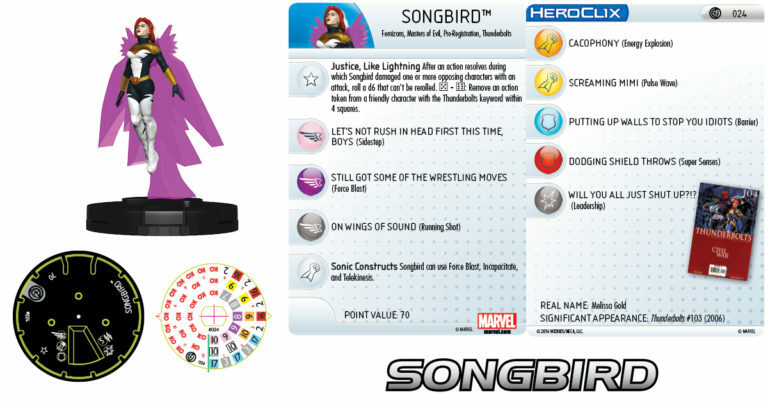 Much like Radioactive Man, Songbird is a 70-point character, who is able to attack two targets from 5 squares away. She possesses 1 attack special power, which appears on her first two clicks called Sonic Constructs, which gives Songbird the ability to use Force Blast, Incapacitate, and Telekinesis. Access to these powers makes her a natural board controller that can move, freeze, and place characters. Songbird also has a myriad of standard powers, including Sidestep, Force Blast, Running Shot, Energy Explosion, Pulse Wave, Barrier, Super Senses, and Leadership. Our next team member towers above the rest of the ‘Bolts, and features the Giant Reach, Great Size combat symbol – it’s Atlas! At 90-points, Atlas is a brute force attacker who is suited to bring in the midst of the fight. Like both Radioactive Man and Songbird, Atlas also possesses one special power, appearing on clicks 2 and 3 of his six click dial. Just Like When We Invaded the Mansion grants Atlas the ability to use both Flurry and Sidestep. Additionally, when you use Flurry, after actions resolve, you may place any hit characters adjacent to him! 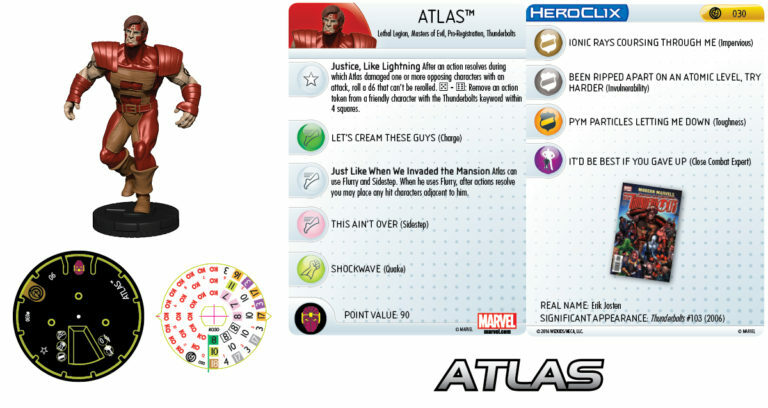 Atlas also has a mix of standard powers suited to his more in-your-face approach, including Charge, Sidestep, Quake, Impervious, Invulnerability, Toughness, and Close Combat Expert. Our final team member was a new recruit during the Civil War, while the Thunderbolts were tracking down and imprisoning unregistered heroes. Jack O’Lantern gave the team another sets of eyes in the sky. His Improved Targeting – Ignores Hindering Terrain, allows him to see though any Hindering Terrain and so opposing characters trying to hide with Stealth are in trouble. As a straightforward attacker, Jack O’Lantern has a mix of powers that include Running Shot, Sidestep, Energy Explosion, Penetrating/Psychic Blast, Toughness, and Exploit Weakness. Use him to deal some nice penetrating damage near the end of his dial. And with Jack O’Lantern, we bring to a close our 290 point Thunderbolts squad! There are a lot of options in this set for you to customize your Thunderbolts to suit your needs – swapping in characters like Bullseye, Taskmaster, MACH-IV, Venom, or Jester, can swing this team in any direction to suit your play style. That’s all for today, ‘Clix fans! Join us next time for more in-depth looks at the Marvel HeroClix: Civil War Storyline Organized Play characters! Until then, visit the WizKids Info Network to find events near you and don’t be afraid to push! Greetings, HeroClix fans, and welcome to another team building study for the Marvel HeroClix: Civil War Storyline OP Event! Today, we’re switching gears a bit to the Anti-Registration side of things, and looking at three heroes of the future from the Young Avengers! 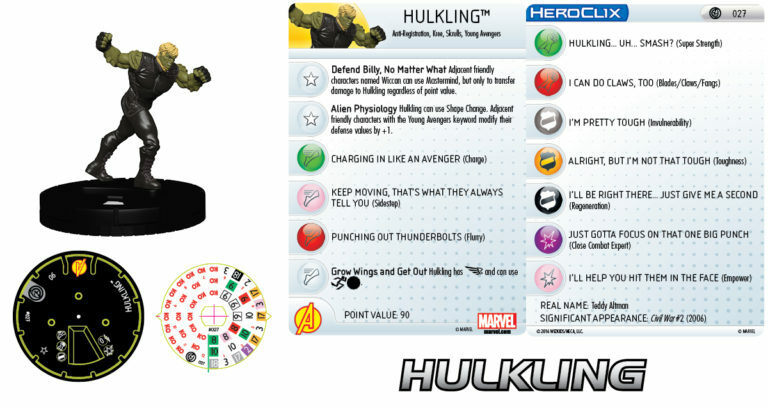 Our first member of the team is part Kree, part Skrull, and 100% Avenger – Hulkling! An indomitable 90-point piece, Hulkling is a vicious attacker with a wide array of powers and abilities that really help him shine. He starts with two traits, the first of which is called Defend Billy, No Matter What. This trait states that adjacent friendly characters named Wiccan can use Mastermind, but only to transfer damage to Hulkling. His second trait, called Alien Physiology, allows Hulkling to use Shape Change. Additionally, adjacent friendly characters with the Young Avengers keyword modify their defense values by +1! Hulkling has a tremendous mix of standard powers throughout his dial, including Charge, Sidestep, Flurry, Super Strength, Blades/Claws/Fangs, Invulnerability, Toughness, Regeneration, Close Combat Expert, and Empower. He also has a special power called Grow Wings and Get Out on his final 3 clicks of movement that grants Hulkling the Flier combat symbol, as well as Improved Movement – Ignores Characters! Of course, inseparable from Hulkling is his loving boyfriend, Wiccan. 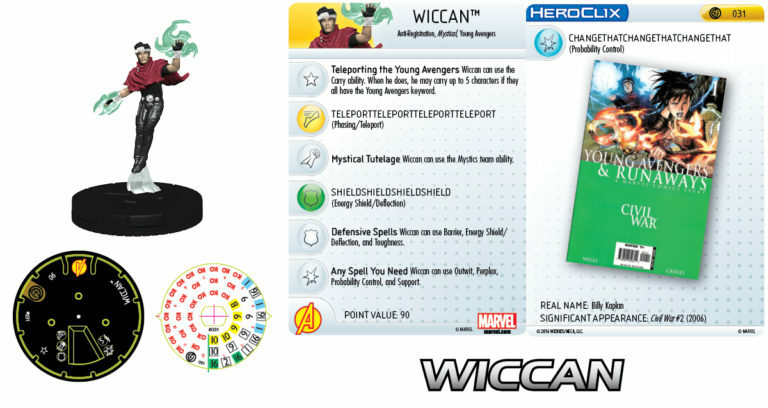 A 90-point piece with a range of five squares, Wiccan is designed to support, transport, and assist his fellow Young Avengers in any way possible. Starting with his trait Teleporting the Young Avengers, we see that Wiccan can use the Carry ability – and, when he does, he may carry up to five characters if they all have the Young Avengers keyword! He possesses only three standard powers – Phasing/Teleport, Energy Shield/Deflection, and Probability Control – but he makes up for that with three special powers. The first, appearing on his first three clicks of attack is called Mystical Tutelage, which allows Wiccan the ability to use the Mystics team ability! His second, appearing on his final three clicks of defense, is called Defensive Spells, allowing Wiccan the option to use Barrier, Energy Shield/Deflection, and Toughness. Finally, on his first two clicks of damage, Any Spell You Need grants Wiccan the ability to use Outwit, Perplex, Probability Control, and Support! Lastly, we have the powerhouse of the Young Avengers team, the daughter of the Ant-Man, Stature! An 80-point piece with 8 clicks of life, Stature is your team’s front line attacker, ready to charge in and mix it up! To begin, Stature has two traits – the first is called Pushing Myself Larger, which states that, at the beginning of your turn, you may have Stature gain the Colossal combat symbol, modifying her attack value by +1 this turn. However, if you do, at the end of your turn you’ll need to deal her 1 unavoidable damage. Additionally, she has a second trait called I’ve Decided to Change Sides. This trait says that at the beginning of the game, choose either Anti-Registration or Pro-Registration. Then, once per game, at the beginning of your turn, you may choose again – Stature modifies her attack value by +1 when attacking opposing characters with the most recently chosen keyword! She also has a solid mix of standard powers, including Charge, Plasticity, Super Strength, Toughness, Willpower, Barrier, and Close Combat Expert! The Young Avengers were the next line of heroes for the Marvel Universe and we feel we’ve represented the team well by grouping these characters together. How about you? Let us know your ultimate Marvel HeroClix: Civil War team, and share it with us on Social Media! Visit the WizKids Info Network to find Civil War events near you. Until next time, shapechange for the win!